Mortlach is one of several distilleries to be established in Dufftown. Mortlach is unique in its way of having a very strange distilling process. The three wash stills and three spirit stills are all of different and unusual sizes and they're not paired off. This complicated process however, produces a top quality spirit which is full bodied and considered to be one of the best in Speyside. 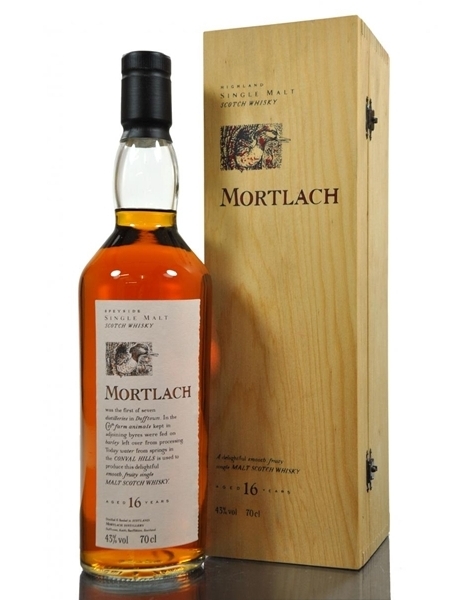 Mortlach 16 Year Old (~€65) from Diageo is a full bodied, sherried single malt, aged for at least 16 years and was released as part of the Flora and Fauna series.